Disney Pixar’s Ratatouille is one of my favorite movies not only because it features the adorable rodent Remy exploring his way through the wide world of human culinary craft, but because of the way the storyline celebrates the true art of creating food. Not just any food, but wholesome dishes, made from fresh and simple ingredients. Upon sampling a bite of cheese and a bite of strawberry, Remy sees fireworks. His epiphany: “Each flavor was totally unique. But combine those flavors together and something totally new happened!” This is what cooking should feel like. To craft a fine meal, you must hold your ingredients in the highest regard. 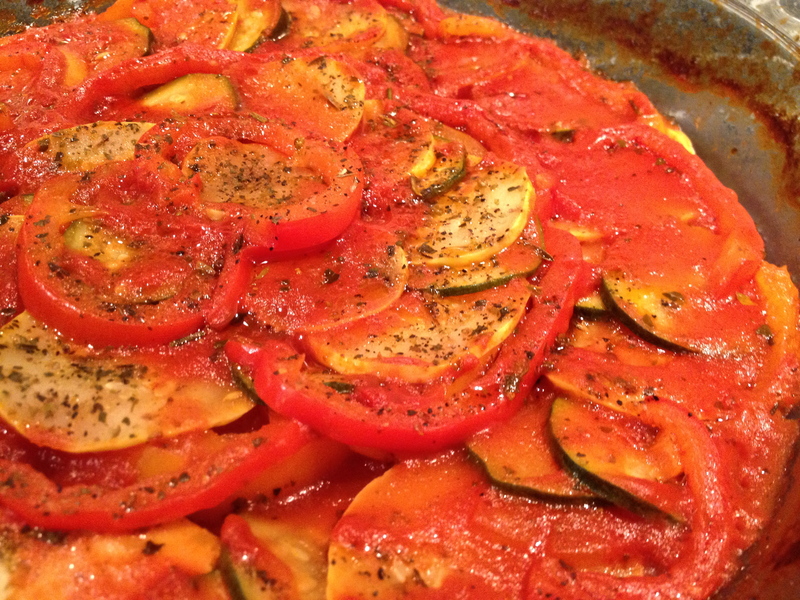 Ratatouille is a dish that highlights the distinct flavors of each component involved. Succulent zucchini, yellow squash, eggplant and zesty red and orange bell peppers are thinly sliced, then drizzled with olive oil, simply seasoned with sea salt, black pepper, Herbes de Provence, and baked atop a garlicky tomato basil sauce – the result is a humble, yet decadent meal sure to satisfy even the snootiest of tastes – at least, it worked with the pretentious food critic in the movie, right? This one-layer version of the traditional French dish, finished with a dollop of chèvre and served atop creamy polenta, is a light and comforting meal great for one (save the leftovers) and even better shared with close friends. 1. Preheat oven to 375°F. 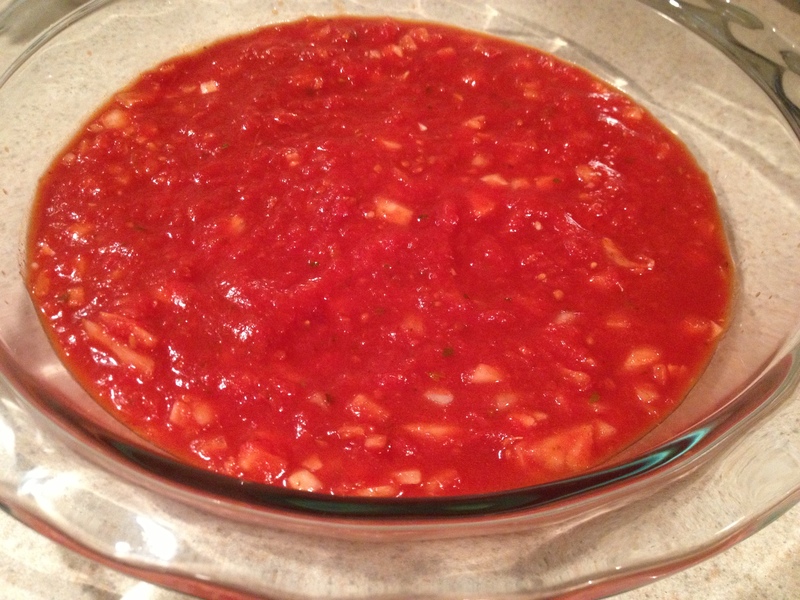 In a small bowl, mix onion, garlic, and tomato sauce. 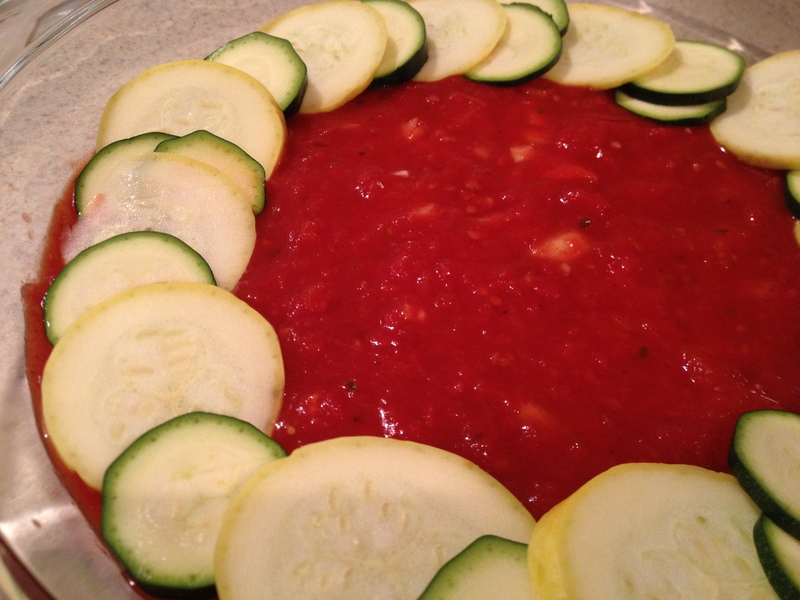 In a baking dish, evenly spread sauce. 2. Using a sharp knife, thinly slice eggplant. Set slices on paper towel and thinly coat with coarse-ground sea salt, top with a second paper towel. Meanwhile, thinly slice zucchini and squash. 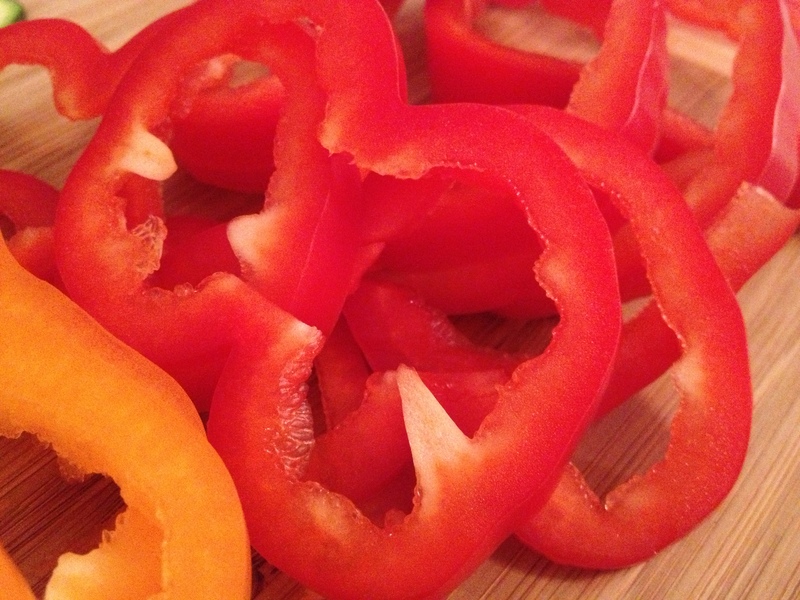 Slice off stem and remove seeds from bell peppers, thinly cut into butterfly shaped slices or strips. Firmly press paper towel into eggplant, absorbing any excess water, discard paper towel. 3. 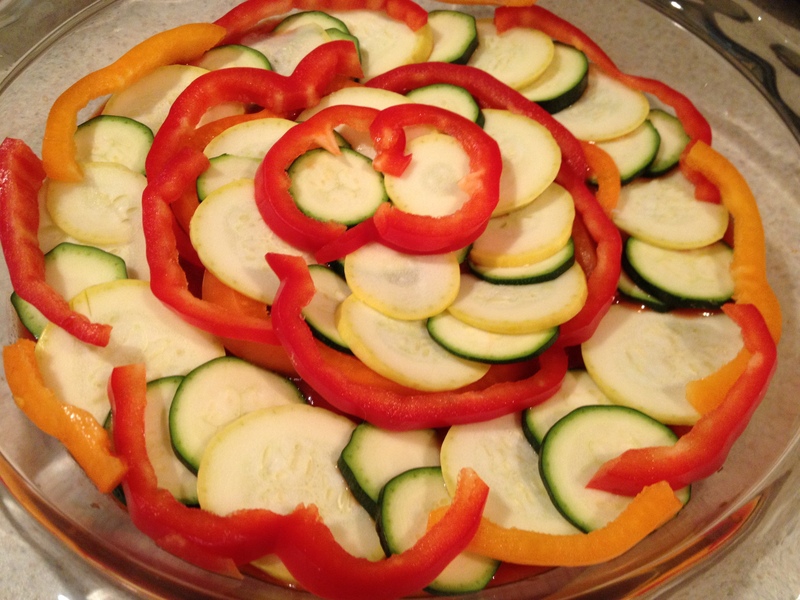 One by one, arrange vegetable slices – alternating eggplant, zucchini, squash, and peppers – concentrically from outer edge to the inside of baking dish, overlapping just slightly. Have fun with your arrangement here! 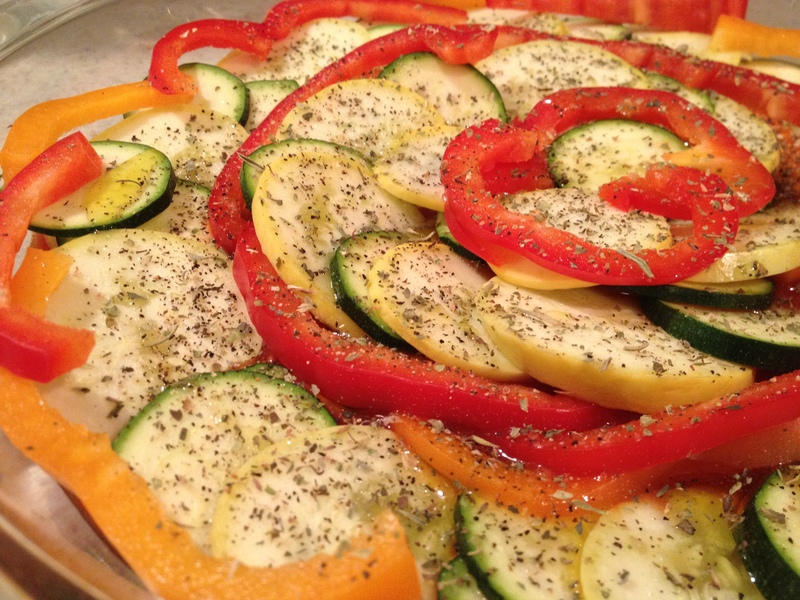 Drizzle vegetables with olive oil, sprinkle with sea salt, fresh ground pepper, and Herbes de Provence. 4. 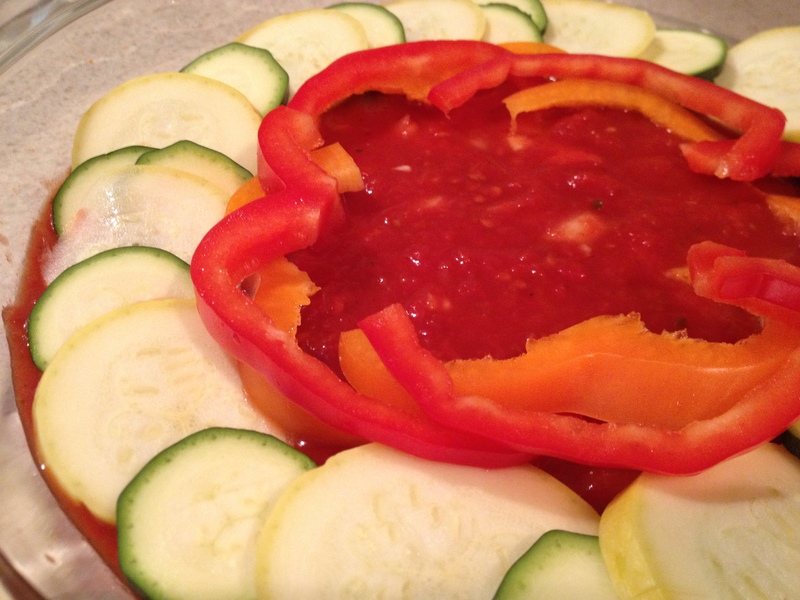 Cover baking dish with parchment paper (tin foil is an adequate replacement) and bake 45 to 50 minutes, ensuring the edges do not brown, until vegetables are soft but not limp and the tomato sauce is bubbling up from beneath them. 5. While the ratatouille is in the oven, bring 4 1/2 cups of salted water to a boil in a small nonstick saucepan. 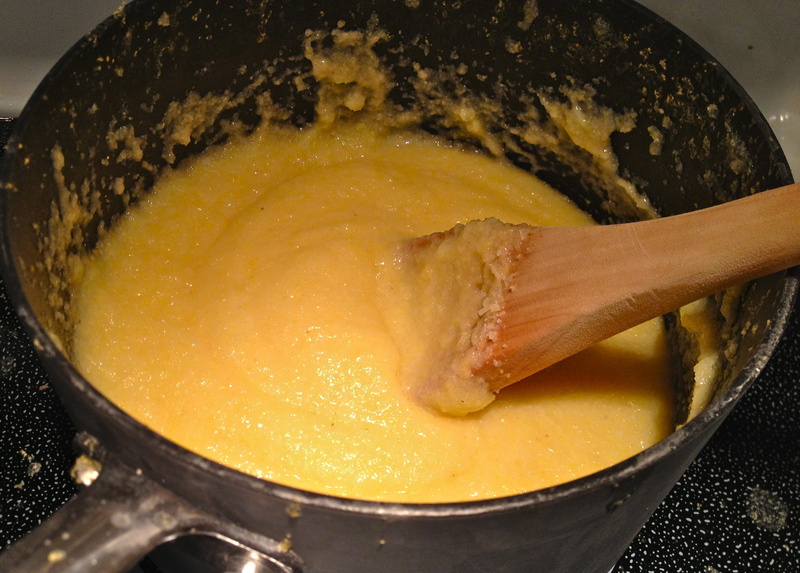 Slowly pour in polenta, stirring with a wooden spoon for about 30 seconds. Reduce to a simmer and cook for 5 minutes. Stir in butter and milk until well combined, increase heat to reduce liquid if necessary. Stir in parmesan cheese and salt. Cover until ready to serve. 6. 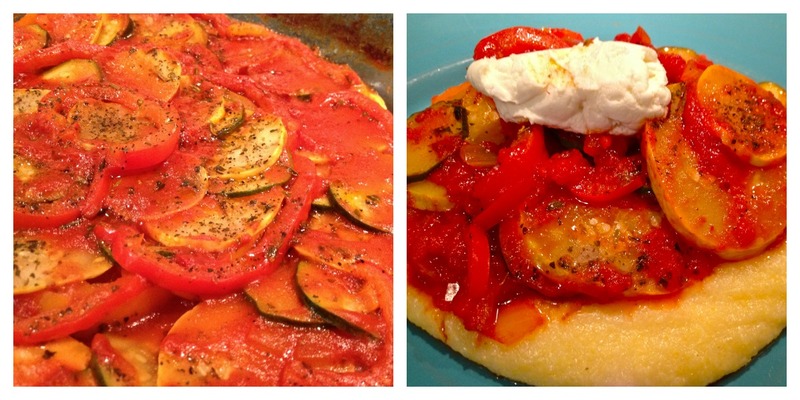 Remove ratatouille from oven and let cool for 2-3 minutes before serving. 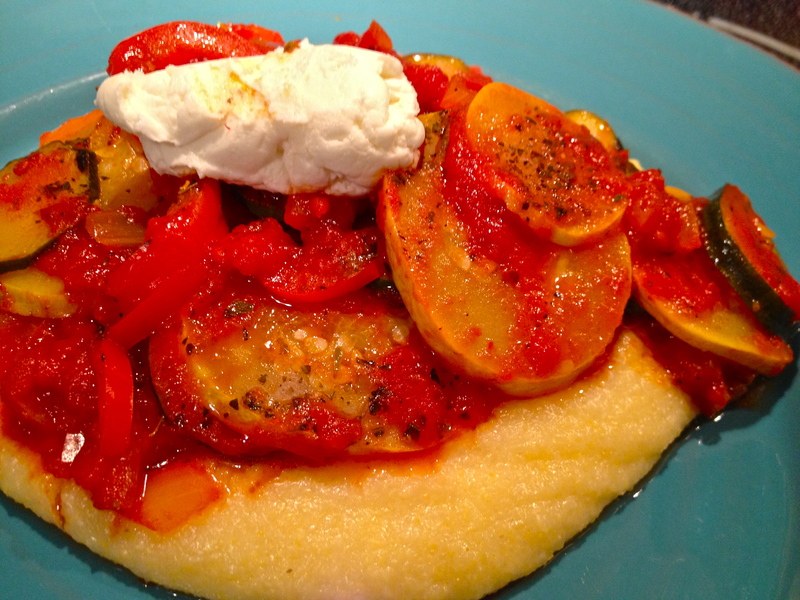 Spoon polenta on clean plate, top with ratatouille and a dollop of chèvre – serve with a simple salad of bibb lettuce and sliced tomatoes with balsamic vinaigrette and french baguette.